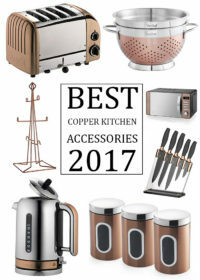 The stainless steel made to order classic kettle from Dualit is available in 25 different colours that accent the steel body perfectly no matter what colour kitchen theme you may have. 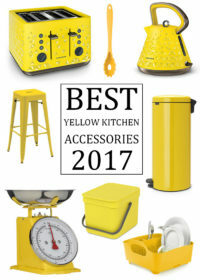 Once you have chosen the colour you desire the colourful panels are hand sprayed in Dualit’s West Sussex factory making this kettle a fairly unique and personalised accessory to add to your Kitchen. 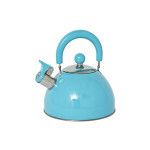 This 1.7 Litre pigeon blue kettle looks stunning and features a ground breaking replaceable element that prolongs the lifespan of the kettle considerably by removing the need to replace the entire unit should any problems occur in the future. 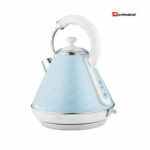 The duck egg blue kettle has an extra fast 3 kW element that allows the user to quickly make hot drinks with the efficiently boiled water. Taking only 90 seconds to boil two cups of room temperature water this Dualit classic kettle is one of the quickest and stylish around. This award winning kettle has been given the international mark of approval from the Noise Abatement Society thanks to it’s patented Whisper Boil function that significantly reduces the amount of noise the kettle makes when boiling. 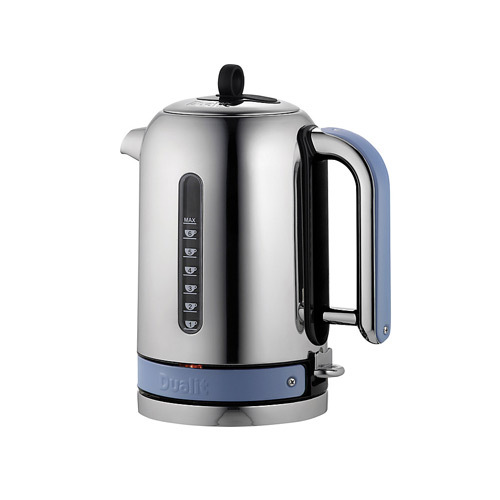 Other features of this good looking Dualit kettle include two measuring windows allowing you to easily see how much water you need with use of the litre scale or based on how many cups of tea or coffee you are making ensuring you always boil the right amount and do not waste energy each time you make a brew. 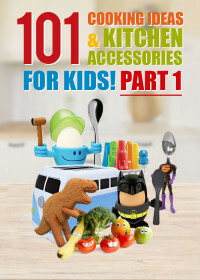 The kettle has a non drip spout for less spillage and patented anti wobble feet to keep it securely positioned on the kitchen work top. The 360 degree swivel base and ergonomic silicon grip handle make using this kettle comfortable and easy whether you are left or right handed. 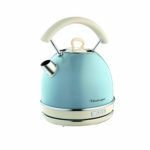 The overall dimensions of this kettle measures H-21.3 cm x W-15.5 cm x D-28.2 cm and there are also matching 2 or 4 slice toasters available from Dualit that can be found here in our toaster category or that can be viewed upon visiting the retailer.